The gorgeous color of the Miche's Riley for Classic Bags might just remind you of a sweet caramel macchiato with an extra splash of vanilla! 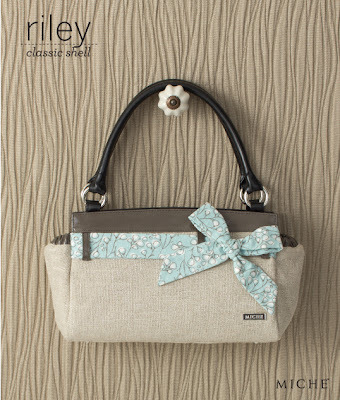 Riley features unusual jute fabric in light tan with an unexpected sparkle of silver threading throughout. Taupe faux patent leather belt loops as well as top and end pockets detail. Includes charming soft blue fabric bow with white cherry blossom print. Its really beautiful and stylish bag.i love this color of bag.its a fashionable bag.